Welcome to 2015 New Quilt Bloggers Blog Hop! Last year, I participated in Plum and June's blog hop for new quilt bloggers. It was such a nice experience for me which taught me a lot about quilting and blogging but also allowed me to make new friends who share the same passion with me. When Quilting Jetgirl, together with Meadow Mist Designs, Late Night Quilter and Childlike Fascination announced that they were hosting the 2015 New Quilt Bloggers, I decided to participate for all the same reasons. Today is the first week of the blog hop and at the end of my post, you will find the other bloggers who are joining in the fun. Let me start with telling you a little bit about myself. My name is Nurdan, aka Hug-a-Bit Quilts. I was born and raised in Turkey, met my (Aussie) other half there as well, got married and followed him to Australia to start a completely new chapter in my life. We have been married for six years and have a three year old boy who is excitedly waiting for his baby sister's/brother's arrival in 20 weeks! Eeep!! I work part-time as executive and program manager at one of the learned Academy's in Australia. I love listening to music, catching up on my favourite Turkish soap opera (but currently addicted to Orange is the New Black!! ), reading, visiting my favourite blogs, and of course quilting, which is quite difficult to find time to do recently. We will be moving to Buenos Aires early March 2016 for three years. I am so looking forward to this for many reasons, one of which is having much more quilting time!! My interest in arts and craft has always been something I had inside which never required encouragement from my parents or others. That's how I learned knitting, crocheting, cross-stitching and sewing. I remember, as a child, sitting next to my mum while she was doing machine embroidery and just watching her and asking lots of how's and why's. It always felt like a therapy. I had no idea about what a quilt was until we came to Australia and visited one of my husband’s friends. I saw all those gorgeous wall hangings and beautiful throws on the sofas. The lady of the house told me that she made all those QUILTS. I developed an immediate love and that love has grown more with the first quilt I made for my son when I was expecting him. These two are my first and still my favourite quilts; they are so special to me as they remind me of my baby's first days and the start of my quilting journey. See how brave I was that I free motion quilted my first quilt?! 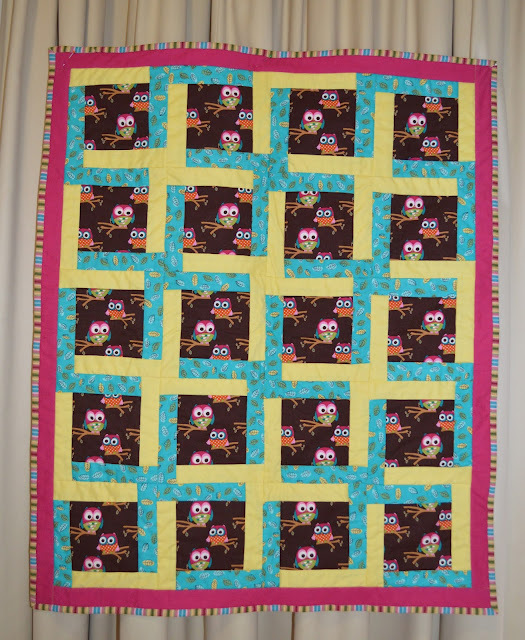 I designed this cute owl quilt. I had no idea about Y seams those days but this quilt required lots as the blocks are not log cabins even though they look like it. Again, something I just thought could work if I did it that way. And here are a few pictures of my more recent finishes. Very proud of this quilt as I designed the quilting pattern myself. Just love how it turned out. You can find more photos of these projects and other projects on my blog. People ask me why I make quilts; isn't it taking too much of my time, isn't it a waste of time??? (instead I can sleep for example-suggestion!). 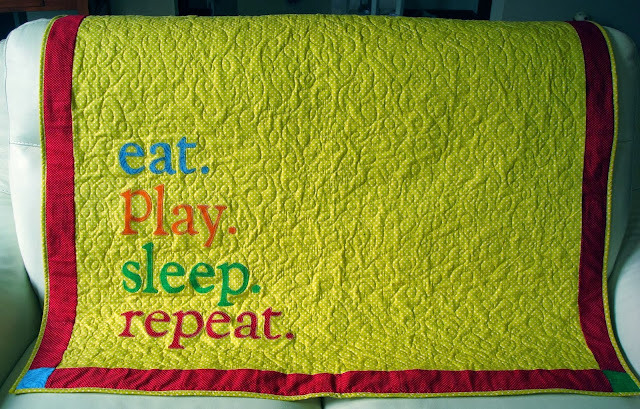 I make quilts because I, first of all, like making things. During the last few years, I found that sewing and quilt making make me feel relaxed; it eases my ever-talking mind, allows me to express myself. It is keeping me mentally active and healthier which then leads to a better physical health. Playing with colours and fabrics is my toy which I can never get bored of playing with. What would I ask more? I can't finish my projects quickly because of other commitments; this used to stress me a lot. Now I just enjoy the process and be grateful that I have a spare room in my house where I can be just me, close the door when I finish and come back to it whenever I want to. This is also my quilting tip to you all. Don't just rush and finish things for the sake of finishing them, don't stress yourself, enjoy the process. Now I want to tell you a few things about me that not many people know! 1. I was singing at a pub when I was a university student in Turkey to pay my costs. I had quite a large group of audience! 2. I received an offer from a recording company in Turkey. After many discussions and initial recordings of a few songs, I turned it down because of the cost of the whole thing. 4. The story of my blog's name: I finished my second quilt for my son and showed it to my husband. He loved it so much and praised me which made me very happy. Immediately following this conversation, I said "Come on, let's hug a bit." and we cuddled on the sofa. That moment on, I decided that this was the name. It took a year to start my blog but I never gave up on the name. Still reading? Great and thank you very much for stopping by!! Now that you know a little bit more about me and my quilting story, I want to finish with a question: Why do you quilt and what do you like about quilting blogs? Please also be sure to check out all the other bloggers in this week's blog hop and do not forget to link up with Monday Makers! You sure were brave to FMQ your first quilt! I still haven't moved much beyond straight line quilting and so I have made good friends with a long armer! Hi Denise, great to meet you, I'm from Quantum Quilters too! I enjoyed seeing your quilts, I really liked your grey stripped bed one and the triangle one as well, though they are all great. You are brave FMQ your first quilt! Looks like you were a natural quilter. Your first quilt is so pretty..... Especially the fmq! Your newest designs are also beautiful. You are very talented! Hi fellow Quantum Quilter! I really like your triangle quilt and Layers of Charm. The quilting on Layers of Charm really compliments the pattern. Great to know more about you and how your blog got its name. buenos aires sounds exciting! I have been quilting for quite a while and still freak out doing FMQ! You were so brave to try it on your first quilt! Beautiful designs and colors on all yours! Quilting for me is a creative outlet! I love to design and explore and make...every single day! Your first quilt is AMAZING! Really! Applique and free motioned on your first - Wow. Nurdan, you are someone I'm happy to follow. Nurdan, Congrats on the pregnancy!! How exciting to be looking forward to another child. Are you going to find out the gender or let it be a surprise? I LOVE the tablerunner that you showed and pinned it for future inspiration. Did you use a pattern or design it yourself. It is gorgeous and just my style. So glad to meet you this morning via the blog hop!! The FMQ on your first quilt is amazing for your first time. We won't talk about my first attempt at FMQ a quilt :) I quilt for my sanity and for the safety of others. It's just nice to have an outlet to express myself. Congratulations on the soon-to-be baby! How exciting! Beautiful post, and so glad to read a little bit more about you. Congratulations on all your sweet finishes, and your sweetest WIP! I love how you came up with your name. How exciting writing your own patterns. Hi! From another member of your 'hive' from the 2015 New Quilt Blogger's Blog Hop. Thank you for sharing about yourself and your love of quilting. I also find planning and making quilts a relaxing creative outlet. I tend to think of quilting blogs as on-line magazines so I enjoy reading tutorials, being inspired by galleries of quilts and finding out more about the people who make them. FMQ and Y seams...you were brave. I'm working on FMQ but haven't tried Y seams yet. All the best with the new baby. I'm happy to have met you through this post Nurdan. You were smart to tackle fmq right at the beginning Thanks for sharing all these beautiful projects. I quilt because I love playing with the colours and like Allison I think of blogs as reading a magazine article. It's great to learn a bit about people and to also be inspired by their work. Great story. Congrats on the expanding family! I am a bit of a minimalist so I need to use my creative energy on projects that are useful. Quilts fit the bill nicely. I like blogs that showcase both talent and personality. I love getting inspired by others. Hi Nurdan, I've come over for a visit from the "New Bees" to say hello. Congratulations on expecting a new baby! 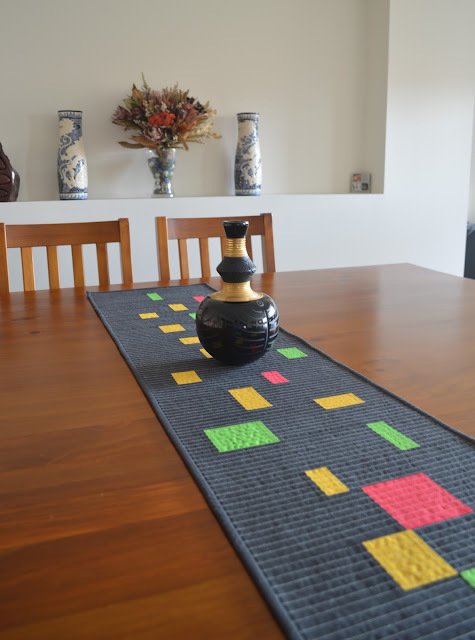 I love all of your projects and am impressed by your fmq bravery! For me, quilting is my special place where I can be myself. I read blogs to find inspiration and feel connection with other like-minded people. Hi from a Sew Fabulous Hive member. I love that you jumped right into FMQ. I love to FMQ myself and keep trying to convince people to just do it! Hi Nurdan, great to meet you. We seem to have a lot in common in the fact that I just jumped in and free motion quilted my very first quilt as well. I can also play just about any instrument that I touch, but the first time I sat down to a piano when I was 7 or so I played Beethoven. I can still sit down and randomly play classical on the piano if I'm motivated but it takes more effort now that I'm older. Not having a piano in my home anymore also makes a difference which is why I quilt more! Hi Nurdan! Congratulations on the good news! I love blogs for many reasons, but one of the things I like most is seeing the same patterns re-interpreted in different styles of fabrics. It's amazing how seeing something differently can make something really appeal to you. Hi Nurdan. It sounds like you and I have some things in common, for example, I, too often get an idea and then have to figure out how to make it! I consider this part of the fun of quilting. I love creating, too. I don't r re ally know why I chose quilting instead of another art form, but for some reason I never lose interest i it, and I have wndless ideas and enthusiasm for it. As for whyat I like about blogs, I enjoy seeing other peoples' ideas, hearing their thoughts, and community with other creators. Hello fellow Quantum Quilter! I view quilting like a puzzle, and I love a good puzzle - jigsaw, word, murder mystery, etc. There is such a feeling of accomplishment when completed. Beautiful quilts! I quilt because I have to make things, it's just who I am. I found that I really love fabric. Oh, and of course the reason of keeping my mind busy. Most of skills have come from reading quilt blogs. There is just so much information. A fellow Aussie - great! I like quilting because I love fabrics and I need something to do with them! What I like about blogs is the inspiration and stories. Love that triangle quilt! I love that your first two quilts show that you were just doing it, not being held back by worrying about what you didn't know. I recently made a king size quilt similar to your owl quilt, but with 36 blocks. The y seams aren't too bad. I guess they'd be harder perhaps if they were not right angles or if the seam lengths were shorter. 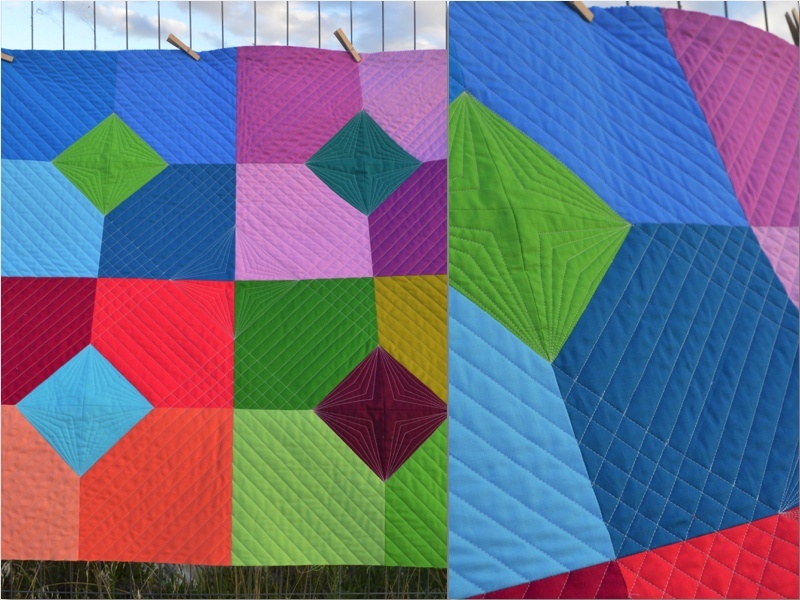 I love the bold color in your newer quilts and what a cute story of your blog title. Thanks for sharing! Nurdan, I really enjoyed reading about you and your work. I love you style. I also took Jacquie's class and want to work on that Rise Up quilt. Yours looks great! I also agree with enjoying the process, I think even when it's something that is a little tedious we should try to enjoy it and master it. Thanks for sharing! Hi Nurdan! I'm stopping by from the Quantum Quilters. Love your quilts, especially the first one that you FMQ'd and your scattered colors table runner. I also really like the clean, simple lines of your blog layout. You have a very interesting story, from Turkey to Australia and then Buenos Aires next year - so exciting! Great post, Nurdan! It was really nice to get to learn a little bit more about you. I can relate to why you quilt. For me it's about stress relief and giving my non-stop mind a break. I love your Rise Up quilt - I'm guessing you quilted it yourself, no?! Very well done. I'd love to see some of your Turkish embroidery, I'm sure it's lovely too! I quilt for the same reasons you do - I find it relaxing and a great creative outlet. Plus, there's something so exciting about creating something from scratch - a brand new thing that never existed before, made with your own two hands. I hope you're enjoying the blog hop so far! Hello and nice to meet you Nurden! I am really impressed that you free motion quilted your first quilt, and it's not even a stipple! Your quilts are all beautiful. Moving to Buenos Aires sounds like an amazing opportunity, I'm a little bit jealous! I'm late to the New Quilt Bloggers blog hop but wanted to tell you how much I enjoyed reading your blog. And I want your lovely table runner on my dining room table! I quilt for my own therapy. I'm a mental health therapist by trade and sometimes hearing the stories of horrendous trauma totally drains me. But in my free time, I immerse myself in beautiful fabrics and challenge myself to improve my quilting skills, and I feel refreshed and ready to make a difference again with my clients. Hi, Nurdan from a fellow Quantum Quilter finally finding time to catch up. Thanks for your introduction. Your quilts are beautiful and I am so impressed by your FMQ. Like you, I quilt as a creative outlet and to simply create. I kinda hate that "how long did that take" question. This is so lovely and I am drawn to your color! I remember you from last year and I love your story. Most importantly congratulations on the newest arrival! I can't wait to see the little one! Your next adventure sounds exciting and I hope you take us along your journey! I relate a lot about "why" we quilt. I have had to definitely realize the fun part of it all rather than all of the stress that falls with it! Your work is beautiful and I'm a total sucker for color! Hi Nurdan, it was lovely to get to know you! I love that tablerunner and the quilt you are working on for your son is going to be wonderful!